The founding of the Hudson Valley Senior Residence was based on a rich commitment of local benefactors who contributed both time and resources to making the facility a reality in 1919. Although there were many Ulster County notables involved in the home’s formation, two stand out and exemplify the commitment, time and resources needed to start and sustain a community based non-profit facility committed to the comfort and care of our senior population. Rear Admiral Francis H. Higginson was a strong force in organizing and putting forth the idea of a home for the elderly by mobilizing county wide support and seeing the idea through to completion. His commitment was in time and organizational skills, a much needed resource in any non-profit. Herbert Carl donated the building to house the first residents and organized a community wide campaign to raise funds to operate the home during the first few years. He committed not only time, but also financial support, another needed component to a successful non-profit facility. In honor of the commitment, time and resources our founding donors provided, and to publicly recognize those who continue this legacy of giving for the Residence today, the Higginson & Carl Society was established. 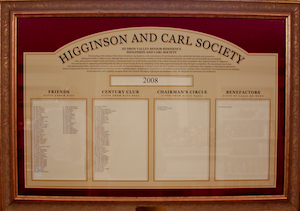 Donors to the Residence are recognized by placing their names in the appropriate column on the Higginson & Carl Society display in the lobby.